“Mistress Suffragette” by Diana Forbes is a wonderful and detailed journey that takes you back in time to the late 19th Century Gilded Age (1870-1900). It is a vivid story that merges romance, fiction, and historical events that took place during that age. Diana Forbes’ fascinating descriptions of the time and characters will make you feel you are right there witnessing all the events. Set in Newport, Rhode Island, Manhattan, and Boston, this novel will captivate your imagination from beginning to the end. Penelope Stanton is a young woman who is drawn into the early Women’s Suffrage Movement in the U.S., to find empowerment and a voice in an age where women were not treated equally under the law. During this time she struggles with numerous challenges, from her father´s bankruptcy and an overbearing mother who wants to find her the right marriage prospect ($$), to an eccentric group of friends and a society that is facing the markets crash of the panic of 1893 (a nationwide depression). She also encounters a wealthy suitor (Edgar Daggers) who preys on distressed women and is not at all interested in women’s rights, but promises her financial security. The most valuable asset of women in these times was their reputation, so Penelope Stanton will have to consider all her struggles and yet do what she really wants to do with her life. This novel will give you insight into the incredible courage of the early Suffragettes and the importance of equal rights. 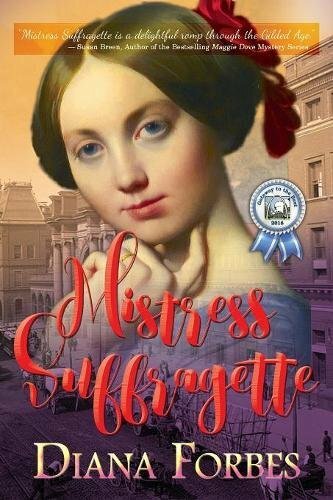 “Mistress Suffragette” by Diana Forbes is filled with exquisite’s details about that period in time, with a realistic storyline, and genuine characters. It is a fantastic and highly recommended read for anyone who wants to know more about that point in history and who loves tales of romance, fictional, and historical events.